Our next fundraising event is called Refashion for Life. 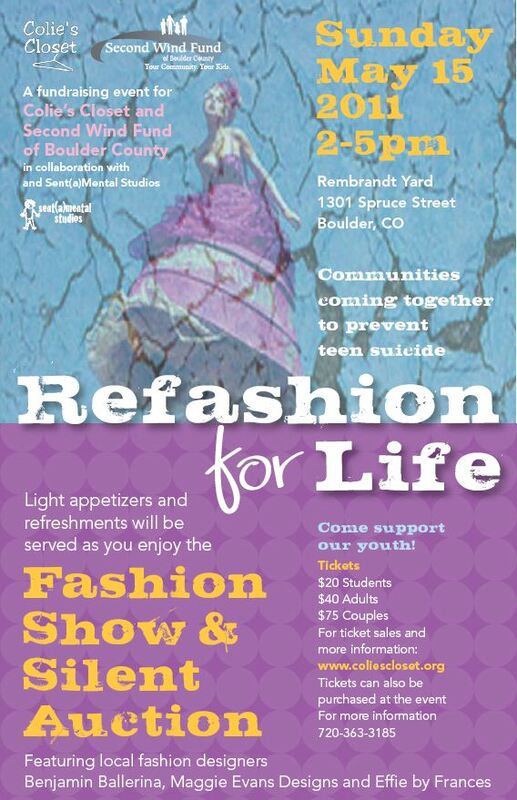 It takes place on Sunday, May 15, 2011 from 2 – 5 pm at Rembrandt Yard (1301 Spruce St, Boulder, CO). Click here for map and driving directions. Thanks to a very generous offer from BSR Ventures, LLC we have been given the opportunity of a $2,500 matching fund. If we match this fund, we will have a total of $5,000 that will go to suicide prevention education and counseling services. This is a wonderful opportunity for Second Wind of Boulder County and Colie’s Closet to maximize our giving/ fundraising efforts. This event is sponsored by the Gay & Lesbian Fund for Colorado. Your ticket(s) will be waiting for you at Will Call on the day of the event.